And now time for a report from the Silver Linings Dept. Because of the California drought, Cherry Creek is poised to have an epically long season. 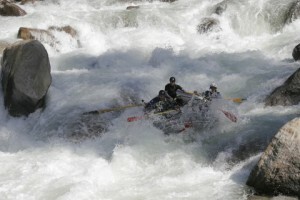 Instead of waiting for the spring melt to wrap up–because on Cherry Creek we have to wait for the water levels to be LOW enough to raft, as there is actually such thing as too much water when it comes to technical, class V whitewater rafting–this year Cherry Creek is pretty much ready to go. Which means our season starts next week! May 3rd, to be precise. This is a good month, month and half early . . . and the season will run until Sept 1st, like the Main Tuolumne. Now that’s a class V season, folks.